If you like chicken schnitzel you cannot beat this easy and delicious chicken schnitzel recipe! Who needs an easy and delicious dinner idea? Well, today is your lucky day! Schnitzel is one of those dishes that for some reason always seemed intimidating to me… until I made it. Now, it is a staple at our house! 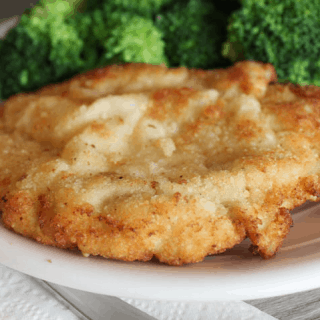 This easy chicken schnitzel recipe totally fills my comfort food craving every time! In the summer months I pair it with fresh veggies or cut it into strips on a salad, and in the winter it’s great with corn and mashed potatoes! Either way, it’s a winner! 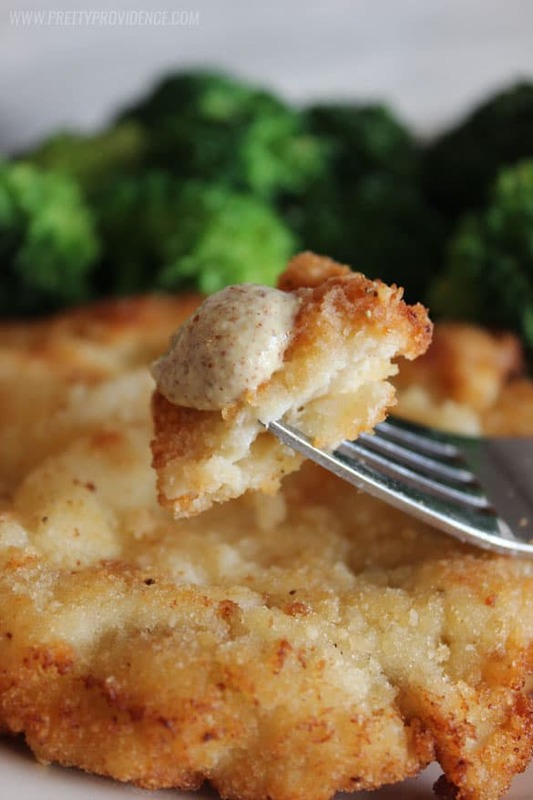 We love to pair our chicken schnitzel with a little Dijon mustard, sooo yummy! Three cheers for a delicious dinner that adults and children can both enjoy! Leave three slices of white bread out to dry if you are making your own breadcrumbs (highly recommend). In a small bowl, add eggs, garlic, parsley and salt and pepper and beat until combined. Pulse bread slices into the blender until they are crumbs. Add crumbs and Parmesan cheese to a small bowl. Pound your chicken until it is about 1/4 inch think all around. I put mine in a large zip lock bag or between two pieces saran wrap and pound with a big glass mug I have.. use what you've got! Dip your chicken into your egg mixture, and then directly in crumb mixture. Heat some oil in a large non-stick skillet over medium heat, chicken is finished when it is golden brown and cooked through (about three minutes on each side). Schnitzel is meat, pounded thin and then breaded and fried. You can make schnitzel with chicken, pork, beef, veal, mutton– basically any boneless cut of meat. What cut of meat is used for schnitzel? You always use a boneless cut of meat for any schnitzel so you can pound it out nice and thin! What do you eat schnitzel with? 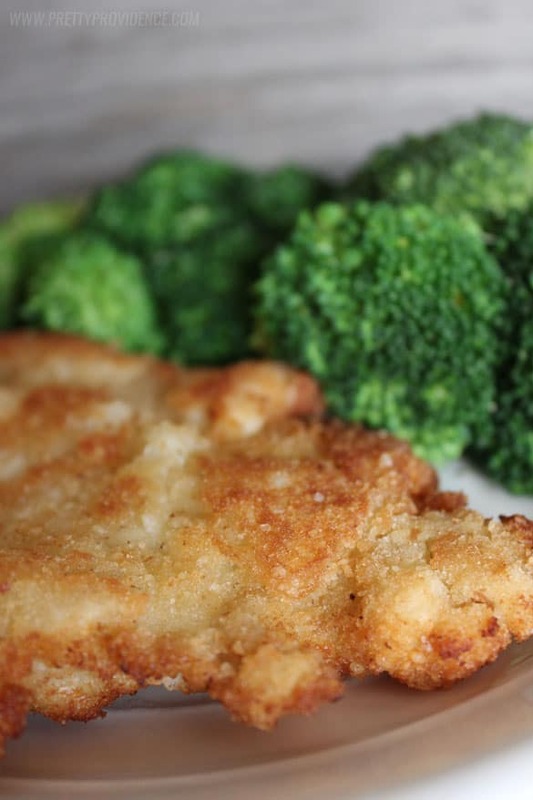 We like to serve our chicken schnitzel with our favorite seasoned broccoli and a potato side, like our delicious funeral potatoes! I hope you love this schnitzel as much as we do! If you are looking for more chicken recipes try one of these! Delicious – used Panko crumbs! Would this recipe allow for cooking up ahead and rewarming when ready to serve (crowd)? I’ve never done it, but I think so! As long as you heat it back up to 165 degrees F it should be safe! I bet my family would love this recipe for chicken schnitzel. It sounds delish! Love how easy this was to make! It was so flavorful and delicious! Swoon! This chicken schnitzel is crazy delicious! Everyone loved it! Thanks so much, I’m always looking for new chicken recipes and this one was a hit! So crispy and delicious! Definitely comfort food! Loved this recipe and super easy to make! Yay! So glad you loved it! Thanks for sharing! Can I use wheat bread for the breadcrumbs? sure! any bread will work! the taste may be slightly different though! That looks delicious! I’ll definitely add that to my dinner menu! Thanks for sharing! Yay, thank you! You will love it!